Transform your attitude, take action, and get results! Virtually everything we think and do is influenced by the questions we ask ourselves - from "What should I wear?" to "What should I do with my life?" Our self-esteem, relationships, and careers are all profoundly affected by these questions. 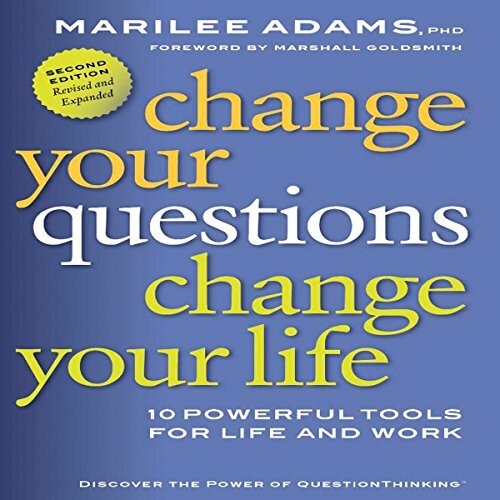 Dr. Marilee Adams introduces "QuestionThinking", an easy-to-use methodology for transforming thinking, action, and results through intentional and skillful question asking. As an executive coach and organizational consultant, Dr. Adams shows listeners how to discern the kinds of questions that block us, and discover the questions that help evoke breakthrough thinking and desired new results. Start asking the right questions and change your life today! This one was very cleverly written, and has tons of applicable advice that can have an immediate impact on your thinking processes. The prmise for this one is that we should be in a "learner" mode as much as humanly possible, and not a "judger" mentality (this applies both to considerations regarding others AND in self-considerations). Adams reveals several techniques to get yourself thinking in terms of questions, instead of statements and answers. It conduces higher level thinking in conversation, more harmony with people in your life, and better results, both at work and at home. Very helpful stuff. Highly recommend, especially for people who are responsible for a lot of folks at work. I Finally Found The Answer I Was Seeking! I'm a 46-yr old professional male. For years I have been trying to understand the "path / road" to the peace and success that I desire in my life. Dr. Adams' book gave me the answer my spirit was craving. For the first time in my life I know understand why "knowing how to question" is the first important step in achieving anything in life. Everyday I see my family, friends and co-workers struggle with life's problems. The same problems that I once struggled with. I also know that if they will "allow" themselves to "learn-to-question" like a "learner"...they will find the answers they seek. All my life I sought "answers". But know I have learned to "question" - and it is truly changing my life for the better. The "anxiety" of life is no more! Questions...what a powerful tool when understood. Thank you Dr. Adams and God bless. Great book on question thinking. It describes how a few key questions you ask yourself and others can change your emotion, how you relate to others and your actions. While I did not like the authors attempt to make a thin plot story to describe her theory, at least she tied it all together in the last chapter and has free material on her web site that helps you implement what you heard. "Questioning" is a skill rarely taught in school, but doing it well - that is, asking the right questions of the right people - can radically transform attitudes, actions, and results. This book provides easy-to-learn tools that can make a significant and immediate difference in people's business and personal lives. Written as an engaging fable, it inspires readers to take charge of their thinking in order to accomplish goals, improve relationships, advance careers, investigate new territories, and in general gain greater life satisfaction. This book explains how to "be your own coach," outlines the author's QuestionThinking Model, and lists the top 12 questions for change. Real-world examples provide practical models for applying the principles in a variety of situations, while a Choice Map is a useful visual tool that demonstrates that everyone has a choice in every situation, even if it is not immediately apparent. Didn't excite me too much about the narration but it was ok. The point to bring you back to listening and think about things in a new and opposite view is simply valuable for everyone. I listened about half way the second time and will likely again. If you are in self help and self improvement, you should go for it. It will help you. I listened to this book as a way to enhance my ability to coach my clients into better health. I applied the principle to a potentially heated conversation with my husband, without his knowing I was intentionally trying a different approach. the conversation was very smooth, proactive, loving and he commented at the end, with enthusiasm, that he couldn't beleive how well the conversation had gone when compared to similar conversations in the past! I plan to listen to this a second time. The story was very effective in conveying the concepts and practice. Good, practical approaches with advice about how to switch lanes when needed. I just bought this book. It was priced at $5.95. but I was charged over $13.00. There seems to be nowhere to get help with this on Audible. Please direct me to the right place. I took a screenshot of the page showing the price. I loved the parable and found learning the ideas easy. I would love to become adept at question thinking. I've learned how much I need to improve at switching from a Judger to Learner. I need to be a leader in asking the right questions of myself and others. I'll be returning to this story and lessons again and again. Couldn't finish it... It was just too annoying. The style of this book is motivational and whilst it is presented as a narative, there are some real life examples and situations which I could easily relate to. A very good aspect of this book which I have not found in many, is that it provides actual tools that can be used in daily life. A couple of irritations though. This book mentions a workbook and a chart which should be made available with the audio download. Although, in one of the early chapters a web site is mentioned from where the chart can be downloaded, I had to register with them for a newsletter first. Even so, I have still not found a way to get the chart.